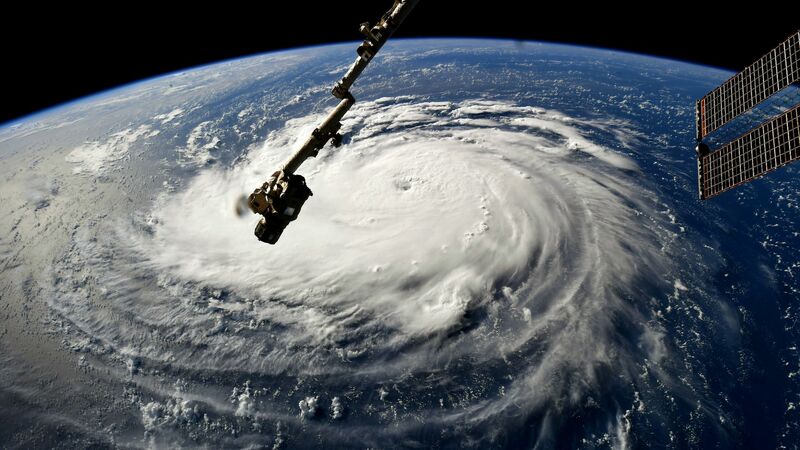 Hurricane Florence gains strength in the Atlantic Ocean as it moves west, seen from the International Space Station. Photo: NASA via Getty Images. Hurricane Florence is a nightmare storm for the Carolinas and Mid-Atlantic. The reasons stem from the hurricane's power, size, forward speed and the longstanding vulnerability of the area it is forecast to hit. Click here for the latest updates on the storm. The big picture: There are no historical analogs to compare Florence to. Its forecast track is unprecedented, and its array and magnitude of threats are as well. The context: If Hurricane Florence makes landfall in North Carolina (north of the border area with South Carolina, where Hurricane Hazel hit in 1954) or Virginia as a Category 4 storm, it would be the strongest storm to do so that far north. Wind: The maximum winds in a hurricane tend to garner the most headlines, and for good reason — they cause significant, occasionally catastrophic damage. In Florence's case, the hurricane's slow, forward motion as it comes ashore raises the possibility that some areas could see an extended duration of hurricane-force winds, which would maximize property damage and infrastructure problems, particularly to the electric grid. Surge, when a larger storm pushes more water toward the shore than a smaller-size storm of similar intensity: Florence's angle of approach to the coastline could act to maximize the surge potential, since it may approach at a nearly 90-degree angle, much like Sandy did in New Jersey in 2012. The surge from Florence could hit record levels of 15 to 20 feet or higher. The storm surge will ride atop sea levels boosted by long-term sea level rise, which has already increased the frequency of coastal flooding, even on sunny days in the Carolinas and Mid-Atlantic. Inland flooding: An anomalously strong area of high pressure stretching out to the storm's north, over the western Atlantic, is what is forcing the storm to turn west, into the U.S. The same high pressure area is forecast to cause the hurricane to cross the coast and hit the brakes, to devastating effect. Florence will be carrying a huge amount of water vapor, lapped up from unusually mild Atlantic Ocean waters. As we saw with Hurricane Harvey in 2017, stalled hurricanes and tropical storms can turn entire cities into inland oceans. Climate change has raised the odds of such torrential rainstorms as well. Computer models are vacillating on which areas will get the most rain, but maximum rainfall amounts above 30 inches are possible — and this swath of flooding could stretch toward or over the Washington, D.C area as well. North Carolina has seen major inland floods from hurricanes before, most recently during Hurricane Matthew in 2016. This time, those floods could occur across states that have already had copious amounts of rain this summer and can't absorb much more before flooding occurs, including Virginia, Maryland, Delaware and West Virginia. The bottom line: This storm has serious potential to make it into the history books. Editor's note: this story was updated on Tuesday to take into account the latest forecast information.